Freedom of speech or expression has often been a sore point of contention for those wishing to protect a full freedom of expression (i.e. no restrictions on speech whatsoever) and those who want to limit it within a certain space to ensure a more harmonious society (i.e. the prevention of hate speech, for example, but allowing for a broad freedom of expression nonetheless) - although the former surely does not prevent a harmonious society as a concept itself. With that in mind, intellectual property is no exception, after all, most ways of expression yourself and/or marking your goods to distinguish them often tread the line of good taste and offense in order to further their respective goals. Especially with trademarks there are certain limitations on what you can use as a registered trademark, but does a limitation on your use of said marks prohibit your effective freedom of speech? This issue was largely brought to light in the recent Washington Redskins trademark litigation, where the offensiveness of a trademark potentially disparaging native Americans was a heavy point of contention, and the Redskins were subsequently stripped of their trademark (although the loss of their mark is not as straightforward as that) due to the disparaging nature of the mark. However, the Redskins never brought a claim under the First Amendment of the US Constitution. The matter of free speech was brought into the limelight regarding the refusal to register a trademark after a US Court of Appeals decision in Re: Simon Shiao Tam where the Court affirmed a prior decision to refuse the mark "THE SLANTS" due to its offensiveness against people of Asian descent. The mark related to the name of a rock band called The Slants, fronted by Mr. Tam (including several other members of Asian descent as well). The Court also promptly concluded that there was no impairment of Mr. Tam's First Amendment rights, following the precedent set in Re: Robert L. McGinley some 30 years ago, where the United States Court of Customs and Patent Appeals saw that "...the PTO's refusal to register... [a] mark does not affect his right to use it. No conduct is proscribed, and no tangible form of expression is suppressed. Consequently, [the mark's holder's] First Amendment rights would not be abridged by the refusal to register his mark". Arguably, prima facie at least, a refusal of registration does not prevent the use of a mark, but it does, however, prevent its effective protection under trademark law and can cause issues for the proper monetization of a mark in other commercial endeavors should the holder's venture become more successful than its own field allows it. Albeit this does not affect the use or 'expression' in the mark, but mainly the commercial aspects surrounding the mark. What makes the decision in Re Simon Shiao Tam interesting are the remarks made by Justice Moore, although not dissenting, after the majority's decision to reject the mark (after which the Court of Appeals issued an Order for an en banc hearing to decide the issue). In her Honor's mind: "...it is unquestionably true that trademarks are protected speech under Supreme Court commercial speech jurisprudence" and that "...the government has conceded that “[t]rademarks are a form of commercial speech.”. Because a trademark identifies the source of a product or service for users, it is protected commercial speech". This writer will wholly admit that his knowledge of US trademark law is not as extensive as he'd hope to be, but the argument presented here seems a tad flimsy. The use of a mark in commerce, on the face of it, is not expressing a point or a view, but merely the distinction of a product or service from other similar ones. The more 'offensive' a mark does not correlate to a higher form of expression necessarily, even if it's to utilize or bring to light racial issues. Yet, the US courts will know more of the substantive side of things, so this writer will not address any other jurisprudential issues here, and awaits the en banc decision in Re Tam with interest. Are there any freedom of expressions issues in the UK in relation to the same subject matter? Under the Trade Marks Act 1994 a mark can be refused registration if it is "...contrary to public policy or to accepted principles of morality". This would, arguably, cover any racial slurs or other content deemed offensive in the public's view (such as the name The Slants, potentially). Also, under the Public Order Act 1986 speech inciting racial hatred is not allowed, although the freedom of expression is sacrosanct under the Human Rights Act 1998. Arguably freedom of expression is narrower than the one protected by our cousins across the pond, and would not allow for the use of negative language even in trademarks, provided the mark is against public morality (and negative racial connotations, even if hidden behind good intentions, would probably be). This view was firmly illustrated by the UK Intellectual Property Office's decision in Basic Trademark SA's Trade Mark Application, where a mark was refused under the Trade Marks Act's morality provision, and was seen to not infringe Article 10 of the European Convention on Human Rights (and therefore, the Human Rights Act above). The case does, however, highlight the need to balance both interests: "...[the] right to freedom of expression must always be taken into account without discrimination under s3(3)(a) [of the Trade Marks Act] and any real doubt as to the applicability of the objection must be resolved by upholding the right to freedom of expression, hence acceptability for registration". The UK does have more questions in terms of freedom of expression and registered trademarks, but the balancing of both interests does take it into account even in this area of law. 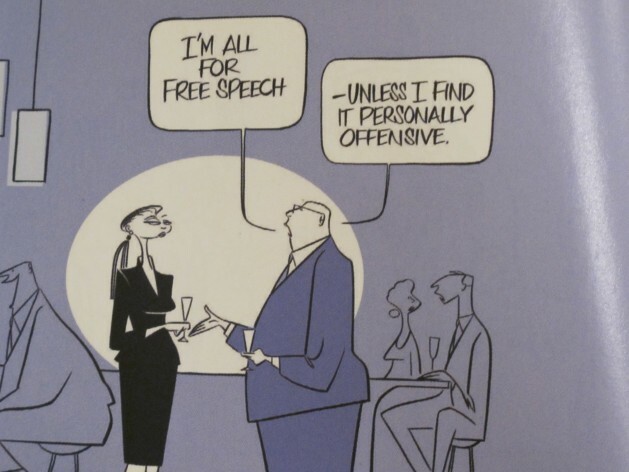 All-in-all the line between the protection of a legitimate freedom of speech (or a more open freedom, such as in the US) and the curbing of possible moral outrage is a fine one, and both interests should be balanced in an assessment of the registrability of a mark. Nevertheless, it is hard to draw a strict comparison with EU and US rights due to their big differences, but both jurisdictions do see a clear need for the allowance of expression even in the world of trademarks. This writer for one, as said above, awaits the en banc decision of the US Court of Appeals in the Tam case, and it will be interesting to see whether trademarks are a true form of expression under US law, and therefore protected by the First Amendment.